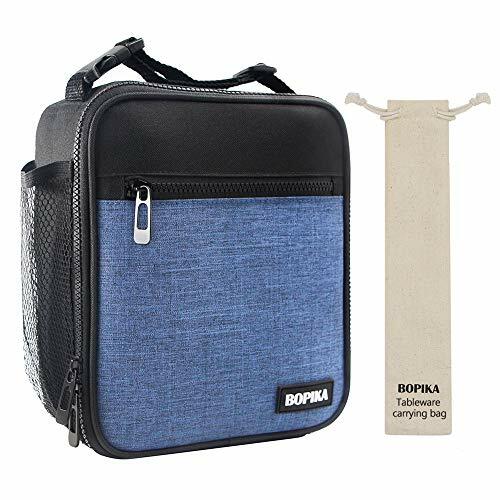 Color:Navy &Black Color:Navy &Black Brand: Bopika Dimension: Lunch bag:9.8*8.3*3.5inch; Tableware bag:9.7*2inch Weight: 260g/0.57pounds Package Include: -1* Bopika lunch bag -1* Bopika tableware bag Specs & Details: Upgraded SBS 2-way dual zipper Exterior Material: 600D Waterproof Oxford Interior Material: Advanced 8mm PEVA foam food grade aluminum insulation Insulation: Foam Core Tech - Aluminum Foil Something about Bopika Lunch bag! A simple lunch bag have enough spaces for your daily needs! We have pay attention to every detail, from material choice to finished products processing, determine to provide you an inexpensive high-quality lunch bag. And we have the professional after-sale customer service team, if you have any problem, just feel free to contact us. We are 100% sure will solve your issues.